Ø It is a group tuition but we usually have a comprehensive 1-1 plan with the parents. 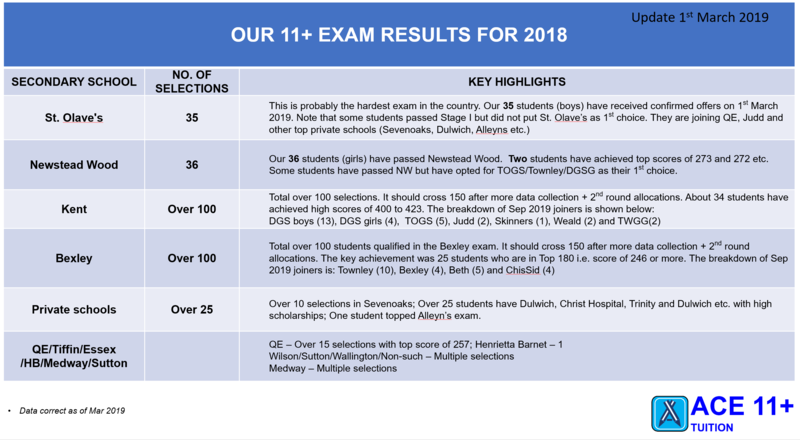 We strive to build fundamentals so that our students not only secures a good chance to pass the 11+ exam but also acquire a strong foundation to do well later in secondary schools. Ø We don't paint a rosy picture and prefer to give you (politely) a honest feedback about your child’s progress. The group structure may not suit to everyone’s needs. If we identify that your child needs a 1-1 tuition, we’ll let parents know well before the exams so that they can try alternative options and maximise the chances to pass. Ø We don’t promise a ‘stress-free’ preparation, but we try to make your 11+ journey smoother. Ø We accept students of all abilities but our admissions/classes are customized to prepare you based on specific schools, your catchment and other parameters. We only do Year 4 and Year 5 tuition with limited support to Y3 children. Ø The Year 5 Saturday classes are super-selective (i.e. aimed at top grammar and private schools). Most of the students are from top sets of various state and private schools. Lots of ambitious material is covered in these classes. Ø The Year 5 Sunday classes are primarily aimed at Kent & Bexley. Students can be at any level to join these classes and they usually live in the catchment. They are taught concepts more thoroughly and at pace that suits their learning process. 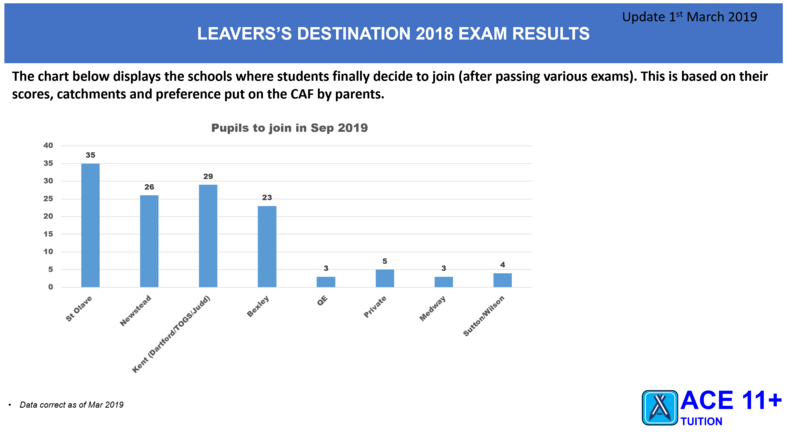 Most of these students also pass the 11+ exams while very few do miss out. But the parents are overall very proud that their children tried their best and learned a lot. Ø Aug Revision course (for Kent/Bexley/NW/St. Olave’s Stage I) and Masterclasses (for Stage II, private schools ) are other specialised classes which are usually offered to internal students only. Ø Most of our tuition intake done via recommendations by parents. For authentic feedback, please feel free to speak with any parents who have first-hand experience of our tuition. You can read FB reviews at (https://www.facebook.com/ace11plustuition/reviews/). Ø We are generally over-subscribed. Our admissions usually freeze after April of every year. Over 15 offers from Sevenoaks. Numerous selections in top private schools - Westminster, Alleyns, JAGS, CLSB, Christ Hospital Trinity & Dulwich etc. with high scholarship.